Library image #323: Two hikers rest on a pass overlooking Goose Lake. The United States Congress designated the Absaroka-Beartooth Wilderness (map) in 1978 and it now has a total of 937,032 acres. Montana contains approximately 913,338 acres. Wyoming contains approximately 23,694 acres. It is managed by the Forest Service. The Absaroka Beartooth Wilderness is located in south central Montana, with a small portion in northern Wyoming, just north of Yellowstone National Park. The Wilderness is home to Montana's tallest peak, the steep rocky mass known as Granite Peak. At 12,799 feet, Granite Peak towers above the Beartooth Plateau. It anchors the Beartooth Range, which stands higher and more rugged than the Absarokas, with many peaks exceeding 12,000 feet (one of them resembles a bear's tooth). The Beartooth portion of the AB is dominated by vast, treeless plateaus, which fall off sharply into surrounding canyons, much like the Alaska Range. Lakes are much more numerous in Beartooth than in the nearby Absarokas. The lakes are small and tucked high into glacial cirques. The Crow Indians called themselves Absarokas, hence the name of the mountain range that, along with Beartooth, characterizes this Wilderness. Active glaciers, sweeping tundra plateaus, deep canyons, sparkling streams, and hundreds of alpine lakes combine to make this one of the most outstanding Wilderness areas in America. The Absarokas, unlike Beartooth, have ample vegetative cover, including dense forests and broad mountain meadows crossed by meandering streams. Mt. Cowan is the tallest peak in the Absaroka Range, topping out at 11,206 feet. Bighorn sheep and mountain goats roam about the mostly rugged country, along with elk, deer, moose, marmots, coyotes, black bears, wolves and members of a substantial grizzly population. The harsher Beartooths accommodate far fewer animals. Trout reside in many of the lakes and streams in both ranges. Adjoining Yellowstone National Park on the park's northern edge, this Wilderness extends down into Wyoming. More than 700 miles of hiking trails provide access to this area, a backpacker's dream. Both ranges offer opportunities to wander off-trail for an unsurpassed Wilderness experience. Wilderness pack trips have a long history in the area, often supported by outfitters. Only a relatively small portion of the extensive Absaroka-Beartooth Wilderness lies in Wyoming. 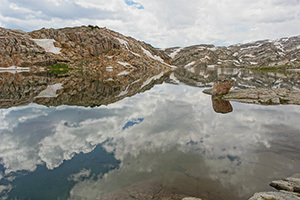 The area is dominated by the high granitic alpine plateaus of the Beartooth Mountains, a starkly beautiful country of expansive views, hidden lakes among bald rocks, and wildly unpredictable weather. Cold and wind may strike any day of the year. Boulder-strewn Beartooth Plateau lies between 9,000 and 10,000 feet below bare crags and peaks streaked with red and yellow. The plateau is cut by deep canyons and carpeted in wildflowers when the snow melts in early July. This is an extremely fragile environment, with large expanses of tundra habitats, rare to the lower 48 states. The lakes are rich in trout, and the air teems with mosquitoes in summer. Wildlife is abundant in the forested valleys: moose, elk, and mule deer live here with grizzly bears. On barren ridges you'll see little except pikas and the occasional mountain goat and bighorn sheep. An extensive network of trails is often under snow until early July. Planning to Visit the Absaroka-Beartooth Wilderness? How to follow the seven standard Leave No Trace principles differs in different parts of the country (desert vs. Rocky Mountains). Click on any of the principles listed below to learn more about how they apply in the Absaroka-Beartooth Wilderness.